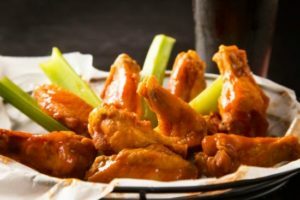 You may hear about wings all thru the fall as football season typically goes hand in hand with a cold beer and hot wings, but chicken wings are something that our customers love to enjoy year round here at Billy’s Sports Grill. We don’t get caught up in the frills of sauce choice madness, we make them how we make them and are really excellent at it! The wings at Billy’s are jumbo wings, each one is very meaty, not wimpy. We fry them and toss then in our traditional Award Winning Wing Sauce and they are served with a choice of ranch or blue cheese dressing accompanied by celery sticks. Award Winning Wings, you ask? Yes, that’s right! Billy’s has been voted Birmingham’s Best Hot wings numerous times in Birmingham’s Kickin’ Chicken Wing Competition. Rightfully so, if you like traditional, hearty hot wings then Billy’s is definitely your spot! You’re not into saucy wings or don’t prefer them fried? Billy’s does offer several other options of great dish. Try them fried without sauce, or ask for your sauce on the side. Or how about enjoying them grilled adding the extra flavor from the flames. One more option and a total customer favorite is having them “double fried, double sauced”. This means the wings are fried, tossed in sauce, fried again then tossed again. This creates a crispier more flavorful wing. It comes highly recommended by many. Now that you have wings on the mind (and my mouth watering), come on out to Billy’s any day of the week and #FeedYourGoat !